Steve Cannon, president and CEO of Mercedes-Benz U.S.A., had some news to share with members of the International Motor Press Association (IMPA) this week. The headline was that according to Polk data, Mercedes' U.S. new vehicle registration numbers topped the luxury pack, beating BMW by over 5,000 units. Why registration numbers? Cannon argued that while tradition sales stats put BMW over the top, registrations tell the real story because they are a strict count of new-car deliveries to consumers, while sales numbers are easy to finesse. To elaborate (liberally) on Cannon's argument, traditional automaker-reported sales numbers are a bit like blood-test results from Tour de France riders who did the tests themselves. At the IMPA event, where Cannon did a Q&A with AOL Autos Editor in Chief and author David Kiley, he took a minute to chat with Marketing Daily about the automaker's Super Bowl campaign for its new CLA coupe, and what the car means for the Montvale, N.J.-based U.S. division of Mercedes. Cannon says that going forward this year, social media and digital will play a major role in Mercedes' efforts to transform the big spike in CLA interest it got from the game into a growth curve leading all the way up to the car's September launch. The first of these efforts include advertising on the Academy Awards this weekend and the car's presence at Mercedes-Benz Fashion Week in New York starting this week. It will also hit the green at the U.S. Open, the PGA Championship and other MBUSA-sponsored events. 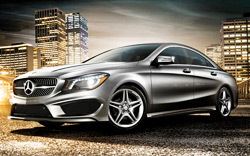 One current digital activation is a promotion at Facebook.com/Mercedes-Benz USA, offering an opportunity to see the CLA in an expense-paid trip to New York in conjunction with the New York Auto Show. But is there a downside? Does the CLA have the potential to steal the spotlight not only from competitive brands, but from its nearest sibling, the C-Class? After all, the somewhat more pricey C has always served as the entry point for the brand. Might people who would have considered the C-Class hang fire until September and grab the CLA instead? Cannon says quite the opposite. "On edmunds.com, we have seen a 100% lift in C-Class [research and consideration]." Those and other metrics, he says, suggest the CLA is a magnet drawing people to the C-Class. Cannon adds that price point between CLA and C-Class is a big differentiator. "We obviously don't want CLA and C on top of each other, so it's important that we separated them [by around $5,000]." He said that with options, the CLA will top out at around $32,000, versus the C-Class at around $40,000. That lower entry price will, he says, bring in people who would have otherwise looked at large, non-luxury sedans. "It will get us access to people who aspired to our brand but couldn't afford it. They will probably be younger and less affluent. The dynamic is that since we have highest loyalty rate in the business, there's a good chance that once we get them in, we hold them." Cannon adds that the busy product pipeline will offer a range of move-up products. "We have 30 products coming in the next seven years -- every quarter a new product."